University celebrates 2nd place in the UK sustainability league! 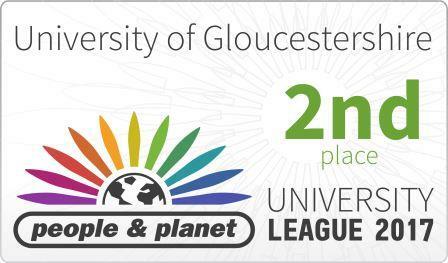 The University has been awarded First Class honours and jumped up 6 places to 2nd position in the 2017 People & Planet University League published today. The league ranks all HE institutions against a set of criteria that takes in all aspects of their sustainability performance and has awarded First class status to only 30 of the 154 institutions assessed this year. The University scored 100% for its academic innovation programmes, sustainability strategy, carbon management and environmental management systems, and made gains on its energy efficiencies resulting in improved scores for carbon performance. “We are thrilled with this result and to have reached 2nd place in the People and Planet league table. This affirms our place as a centre of excellence for sustainability in education and our continued commitment to transforming our University. We punch well above our weight in sustainability and we are proud of the contribution we are making to the UN global Sustainable Development Goals. Tackling sustainability is an imperative for the 21st century and helping our students to develop in this area is increasingly critical for all professions. These are the pressing challenges of our times and they inspire students to be truly innovative and to think and act differently. Our University’s mission is to offer a transformative education and sustainability is becoming a distinctive feature of the experience for students who live and learn with us at Gloucestershire.